(i) The Tropic of Cancer does not pass through. (v) My friend hails from a country which does not share land boundary with India. Identify the country. Question 2. Answer the following questions briefly. Question (i).Name the group of islands lying in the Arabian sea. 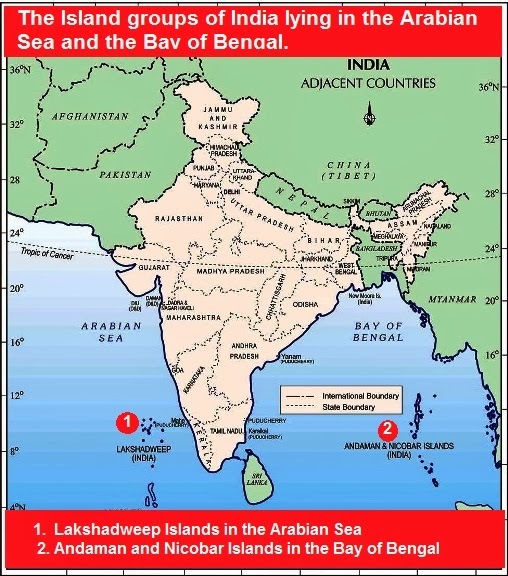 Answer : Lakshadweep in Arabian sea. (ii). Name the countries which are larger than India. Answer : Russia, Chand, USA, China, Brazil, Australia. (iii). 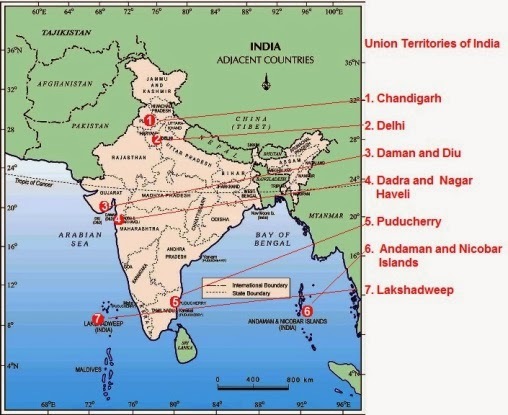 Which island group of India lies to its south-east? Answer : Andaman and Nicobar island. (iv). Which island countries are our southern neighbours? Question 3. The sun rises two hours earlier in Arunachal Pradesh as compared to Gujarat in the west but the watches show the same time. How does this happen? Answer : India has longitiudinal extent of 300. Due to this there is a time lag of two hours between the sunrise on the easternmost and the westernmost horizons of India. due to rotation, the earth takes 4 minute to rotate through 10 of longititude. In covering 300 of longitiudinal extent, there is difference in time lag of 2 hours. When it is 6 a.m in Aruanchal Pardesh, it is still 4 a.m in Gujrat and jasalmer. but the watches in all parts are run according to standard time measured from 82 1/2 00 E longitude. So the watches in Arunachal Pradesh and jaisalmer show the same time despite to different sunrise. Question 4. The central location of India at the head of the Indian Ocean is considered of great significance. Why? It provides India with abundant extended sea routes to apply her trade and common devices/strategies with developed countries (West European) at her left hand and developing countries. (Orient Asian) at the right. It helps India, flowing her stream of wisdom in physical, mental, emotional and psychological fields everywhere in Africa, Asia and Europe continents. It includes spiritual, technical, physiological, anatomical and material (bilateral trade on goods, metals etc.) Knowledge also. India is Jagatguru and Rigveda is the foremost pre-historic scripture in the world - these couple of facts prevail. India holds title authority on India Ocean. In fact, India only has the longest coastline (West and East) in the above said ocean in the world. Latitudinal extent: 804' North to 3706' North. Longitudinal extent: 6807' East to 97025' East. Standard Meridian: 82 1/2 0 East longitude. Southern most point: Indira point. Southernmost tip of mainland: Kanyakumari. Question.1: Identify the following with the help of map reading. (i) The Island groups of India lying in the Arabian Sea and the Bay of Bengal. (ii) The countries constituting Indian Subcontinent. 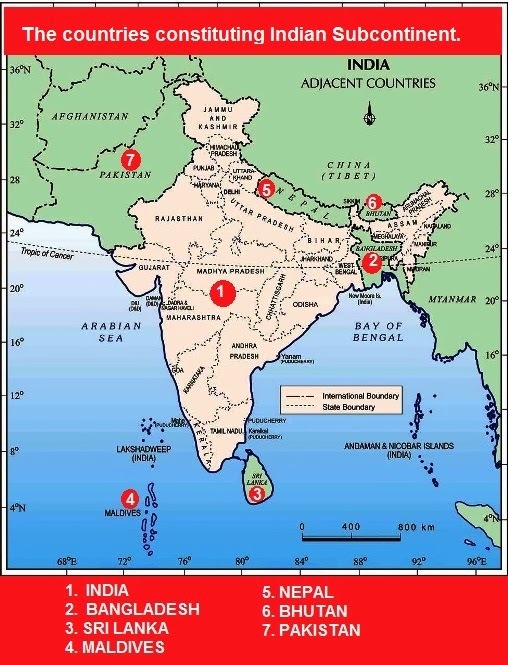 Answer : Countries constituting Indian subcontinent are India at the core, Bangladesh in the east, Sri Lanka in the South (Island country in Indian Ocean), Maldives in South West (Island country in Indian Ocean), Nepal in the north, Bhutan in the north-east and and and Pakistan in the north-west. (iii) The states through which the Tropic of Cancer passes. 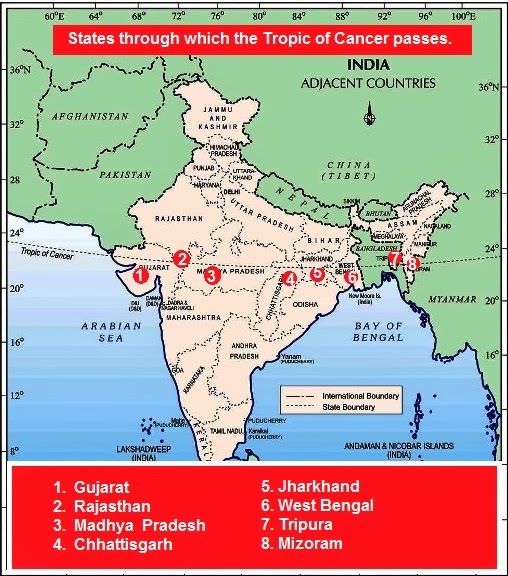 Answer : Tropic of Cancer passes through the states of Gujarat, Rajasthan, Madhya Pradesh, Chhattisgarh, Jharkhand, West Bengal, Tripura and Mizoram. (iv) The northernmost latitude in degrees. (v) The southernmost latitude of the Indian mainland in degrees. (vi) The eastern and the western most longitude in degrees. Answer : 6807' East to 97025' East. (vii) The place situated on the three seas. (viii) The strait separating Sri Lanka from India. 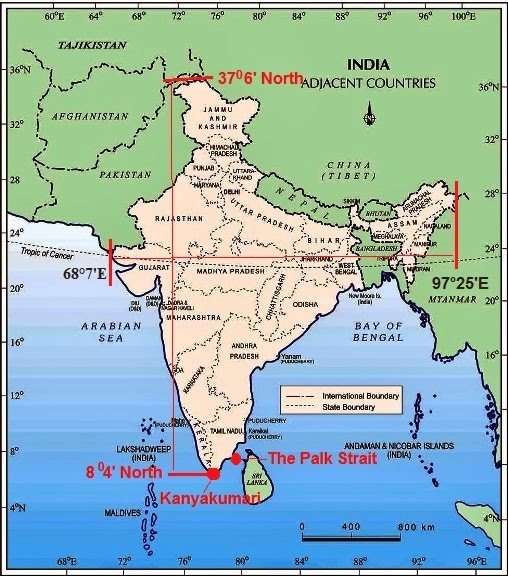 Answer : The Palk Strait. (ix) The Union Territories of India. In question number 3, how it is longitudinal extend,it can also be measure as latitudinal extent of 30 degree i.e. 68.7 degree to 97.25 from west to east, due to this reason there is a time lag of two hours between the sunrise on the easternmost and the westernmost horizons of India.